Happy Thursday! In Denmark – they call it lille Fredag or little Friday. I’m ready for the weekend this week. It has been an interesting one being an American living abroad. And while the outcome of the U.S. election was not what I had hoped for, I am trying to remain positive and spread love. We are all part of #TeamHuman. And the world is watching. BIG TIME. As a travel and culture writer, one of the things I have loved most about starting this blog is being exposed, enlightened and educated about how beautifully diverse yet similar we all are, the world over. What makes us different should not divide us. Sometimes what we don’t know or understand makes this difficult. But I am not going to spread fear. I believe in love. I’m trying hard. I will continue to try and build bridges. Between my world community. With my American community back in the States. I have lived and loved in red states AND blue states. And while I feel much pride about the results from my Oregon, I believe there is much work to be done. In many places. But that it can be done. It must be done. Let us build bridges. Together. It may seem simple to think that a travel blog community could help. But stay with me here – I believe it can. Show us your corners. Your faraway places. Educate and inspire. Please continue to share and connect and illuminate. Bring us together, however far apart. I loved the posts shared last week – these are my favorites. Didn’t get a chance to check them all out? No worries! You can find them all here. Speaking of bridges – Tanja from Red Phone Box Travels shared her favorites from all over Europe last week. I picked her pic of London’s Westminster Bridge as a nod to all those at World Travel Market 2016 this week! Cheers from Copenhagen all you travelers there. And because I needed a little soothing, these lavender fields from France took my fancy something fierce. Ride along with Vaucluse Dreamer in this beautiful bicycle tour through the Luberon. I can almost smell the French flowers! Although, it is definitely NOT summer (or fall really anymore) here in Denmark. Tuesday night marked our first snowfall and I’m ready. But with nary a mountain to be found in these parts, Europe Diaries fulfilled my mountainlust with this post on where locals like to ski in Switzerland. Want to go to points even further north? Like northern lights NORTH? I wanna visit Swedish Lapland and a cozy – YES! COZY! 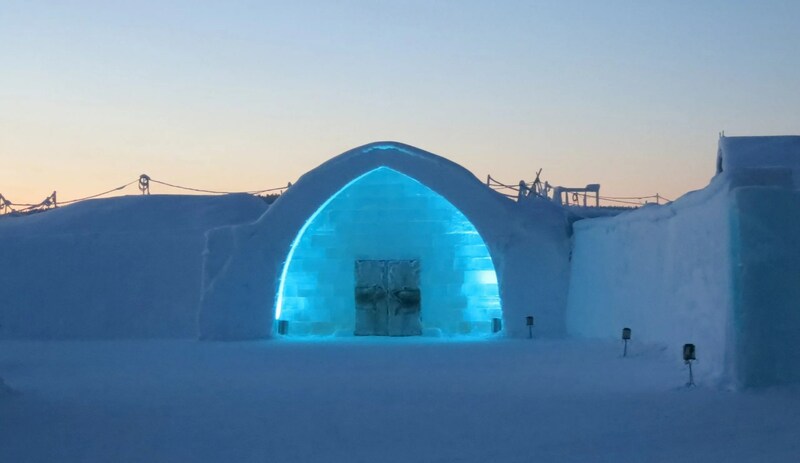 – stay at the Icehotel from Cultural Wednesday blog. So where to this week? Take me away. Seriously. Please. Take me somewhere. Let’s share our corners. Far flung and near. This is Faraway Files. Linkup is open and right here on Oregon Girl Around the World today. I’m taking you back to Madrid and showing how to make this Metroplis manageable. How to make Madrid yours. Share your #swoonworthy images on Instagram. Tag @FarawayFiles and #FarawayFiles – we’ll repost our favorites. We are posting each week’s links on our Faraway Files Pinterest page as well – come join us over there as well! I told you I was a bridge fan! You hit my soft spot! Cheers and thanks for being an engaging member of #FarawayFiles community! Just returning from Italy to the US on Tuesday and the election the same day I was shocked and devastated by the election results for President and spent the whole day yesterday in a funk. I know very few, if any admitted Trump supporters. But was encouraged by the many interactions I had yesterday with those we have surrounded ourselves with in Overland Park that we now call our family. Although they were initially devastated also, they have resolved to continue their lives and work for continued equality and to take care of the poor, the immigrants, the LGBT community, etc thru private donations of dollars and time that may or may not be eliminated from the governments budget. We will do the same and ultimately we know that God is in charge,not Trump, and God will see us through whatever we encounter the next 4 years. Good Time to be living abroad!!! Happy to be back after a few weeks away, cutting right back on social media while absorbing Vietnam. Thanks for hosting! Ooooh – can’t wait to read about Vietnam! On my wishlist! Cheers from chilly Copenhagen! I like your sentiments and positivity Erin. Sharing our travel experiences is really important to help global dialogue and keep learning about all the wonderful places and people across the world. I’m a little obsessed with it now! You’ll just have to go! Is it? I’m picturing lush and verdant rolling hills with mist sweeping in off the moors – no? Copenhagen isn’t wearing her full on winter dark and dim yet – I’ll get back to you in January! Cheers and some sun peeks soon there – or you get to have a getaway! I was also shocked and devastated about the election results. I was not a Hillary supporter, either, but I am just so sad about how divided our country is and worried that it will get worse in the next four years. What I love about travel blogging is associating and forming relationships with people all over the world. It really does give you an appreciation for all people, despite any differences that there may be. This is a feeling that sadly, I don’t feel here in the States right now and I am determined to change that, even if it is just in my circle of influence. Exactly! I love the connections! If I can share just a bit of that – then maybe seeing somewhere else, someone else different won’t be quite as scary. Thanks for your thoughts – cheers from Copenhagen. They wanted Bernie. Joining the linkup for the first time! I’m excited to check out some new blogs!